Unpack all parts. Lay them out flat and organize them. Count out the screws. There should be four 3" screws (long Screws), four 2 1/2" screws (medium Screws) and five 1 5/8" screws(short screws). There should be a seat base assembly, a backrest assembly and two armrests with gussets attached. Attach the arms. The best way is to put the 3"(long) screws into the pre drilled holes in the legs until the tip of the screw just peeks out. Align the arm so that the screws will go into the same holes in the underside of the arm that they came out of. Use 2 1/2"(medium) screws to attach the gussets (curved piece attached to underside of arm) to the legs. 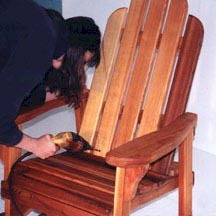 Place the backrest on the chair in the groove behind the seat slats and center it between the arms. Put 2 medium length (2 1/2") screws in and tighten them. 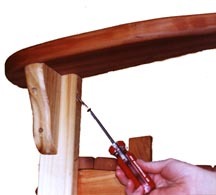 Put 3 short screws in from the back of the backrest and tighten them. That's all there is to it! Now relax and enjoy!